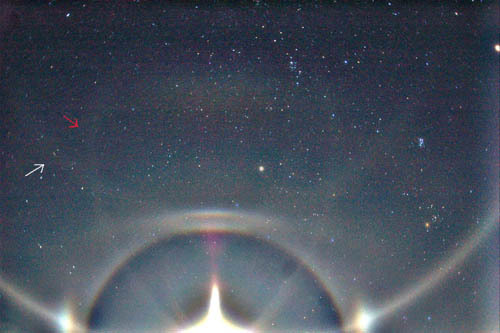 Hastings arc is rare halo from Parry oriented crystals. It was predicted by C.S Hastings in 1920, but it wasn't until 1986 that it was first time observed, by Walter Tape at South Pole. The photo on the left is the latest documentation of Hastings arc. This moon display was seen by Marko Mikkilä at Sievi last December. Like so many of the good diamond dust displays in Finland, it was also made by snow machines. The image is stacked from 6 individual unsharp masked images. White arrow marks the Hastings arc, red heliac arc. The display resists succesful simulating. The problem is the oddly short Parry arc. Mikkilä's simulations indicate towards plate shaped Parry crystals - a crystal falling mode that has been thought of as unrealistic. Hastings arc looks much like the Wegener arc, except that it touches Parry arc instead of 22° upper tangent arc. Simulations series from Parry oriented crystals are here. 11. Jan 1999, Marko Pekkola, J. Moilanen and M. Riikonen, South Pole. 17. Dec 2005, Marko Mikkilä, Sievi, Finland. I hope to see one of them hasing arcs someday.